Global Caster Corporation sells quality office chair casters, dinette chair casters, and stool casters of all types. We have a variety of finishes and styles to match any decor, including antique finishes. We have hardwood and laminate floor safe casters! Caster models are available with non-marring and non-marking thermoplastic elastomer and urethane treads. These treads are proven in to be safe and effective on hardwood, laminate, tile, and terrazzo floors. These single wheel chair casters offer an excellent alternative to the more common twin wheel caster, and are available in a variety of sizes, finishes, and tread types to match with any floor. 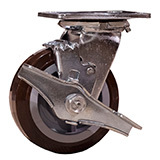 Twin wheel casters are the most common chair casters, and can be in a large selection of tread types, finishes, and sizes for use as chair caster replacements or new caster installation on chairs.